Audi has released August's U.S. sales figures today and it appears American consumers understand three German words quite clearly, Vorsprung durch Technik. With sales up 14% over the same period of 2009, Audi is reporting the company's best-ever U.S. sales for the month of August, surpassing the previous record set in 2003 by 900 vehicles. Most notable were sales of the Audi Q5 Crossover which saw an increase of 78.8% from August 2009 setting an all-time record. Press release after the jump. HERNDON, Va., Sep 1, 2010 - Audi today maintained its 2010 momentum with record August U.S. sales, which surpassed the prior August record set in 2003 by more than 900 vehicles. 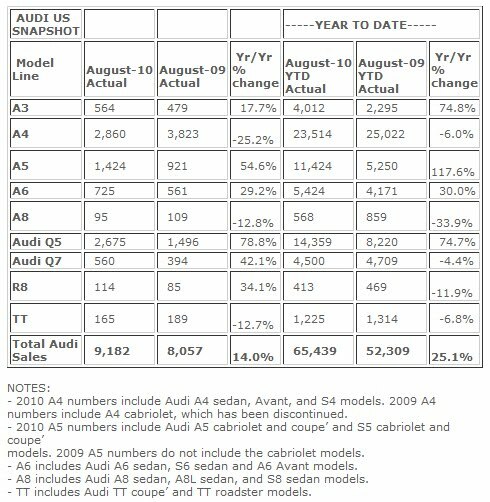 August 2010 sales of Audi cars and SUVs climbed 14% compared to August 2009, and marked the best monthly sales performance since May of this year. The August results keep the German luxury automaker on track to set a vehicle sales record in the U.S. by year-end. The existing annual sales record for Audi in the U.S. is 93,506 vehicles sold in 2007. Overall, Audi sold 9,182 luxury cars and SUVs in August 2010, topping the previous August record of 8,057 vehicles sold in August 2009. Additionally, the automaker posted steady quarter-to-quarter sales increases of more than 5% and nearly 15% over June 2010 and July 2010, respectively. The August 2010 results were buoyed by the continued extraordinary consumer response by year-over-year sales increases for the Audi Q5 crossover and Audi Q7. For the month, Audi sold 2,675 Q5 vehicles, a 78.8% increase over the 1,496 vehicles sold in August 2009. The Q5 line also enjoyed more than a 25% August 2010 sales jump over July 2010. For August 2010, Audi reported Q7 sales of 560, a 42.1% increase above the 394 vehicles sold a year earlier. Through the first two months of the second half of this year, Audi has enjoyed significant sales growth. That gain is largely bolstered by continued consumer demand for the Audi A3, which recorded both a 17.7% uptick in sales for August 2010 and 74.8% calendar year to date. - August 2010 ranks as the best August in Audi of America history. - Audi sales continue on track to set a U.S. record in 2010; first-half 2010 sales of 48,440 topped the record of 45,711 set in 2007. - Five fastest growing Audi U.S. markets in August: Washington, up 60%; Miami, up 55%; Northwest U.S., up 44%; Texas, up 43%, and Northern California, up 33%. 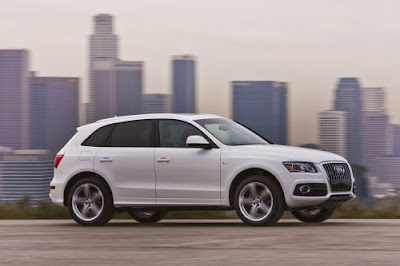 - Audi Q5 sales in August set an all-time record. - Audi Q5 sales up 78.8% for August and 74.7% CYTD; Audi Q7 sales up 42.1% for August, down 4.4% CYTD, due to tight inventories. - The Audi A6 luxury sedan continued sales resurgence: up 29.2% in August; up 30% CYTD. - Audi A3 sales rose 17.7% in August; up 74.8% CYTD. - Audi U.S. consumers continue to embrace Audi clean diesel technology in Audi Q7 TDI and Audi A3 TDI. - Audi Q7 TDI accounted for 66% of all Q7 August sales. - Audi A3 TDI August sales mix of 60% increases 14 percentage points over July 2010. - August 2010 CPO sales fell 6.1% to 2,479 Audi vehicles from 2,640 a year earlier. - Audi CPO sales CYTD were off 11.4%to 18,750 vehicles from 21,172 a year earlier.